One man's patina is another man's rust. I fall into the latter group. 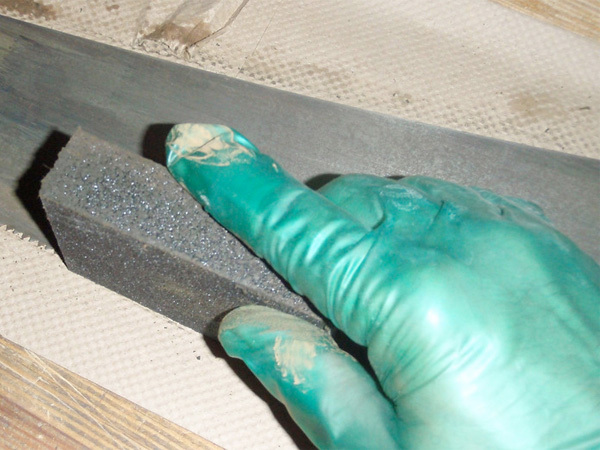 Rust on a sawplate promotes friction in a cut, and should be removed prior to sharpening your saw. You could always pay me to do it for you, but why? All that's required is a little elbow grease. 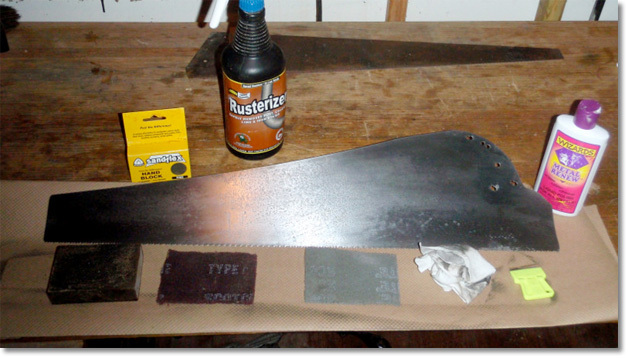 With the procedure and pics below, I'll how you how to clean up your sawplate in about twenty minutes. Here's the stuff I like to use. It's certainly no product endorsement; essentially what you've got is a bottle of rust remover available at any home store, a razor-blade scraper, some Scotchbrite pads (medium and fine), a Sandflex block rags, and metal polish. Note the gloves—use them. And if you have more rust than what you see on this saw, it's a good idea to use a mask. Lay down some cardboard or thick kraft paper to keep the crud off your workbench. 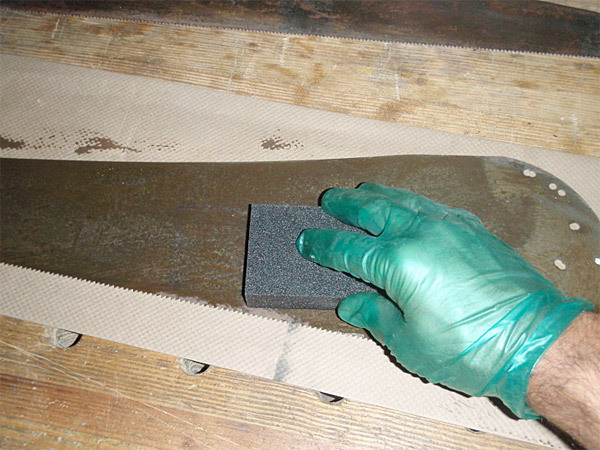 Then spray the bottle of rust remover onto the sawplate and immediately begin scrubbing. 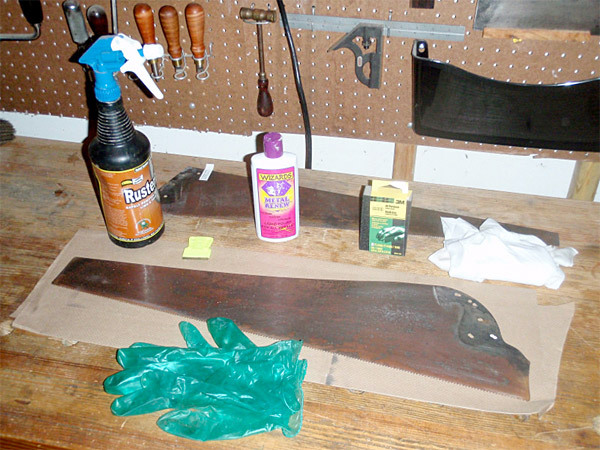 Important to do this quickly, or the rust remover will pool in spots and leave marks on the metal. I like using a fine sanding sponge for this stage of the cleaning. Use it on edge to concentrate on spots where the rust is heavily built up, and hit the teeth with it in particular. There's usually a 'grime-line' that contours the handle—this is a good time to scrape it off with a razor. Be careful—don't want to scratch the plate, so use a sharp razor and don't let the corners dig into the sawplate. 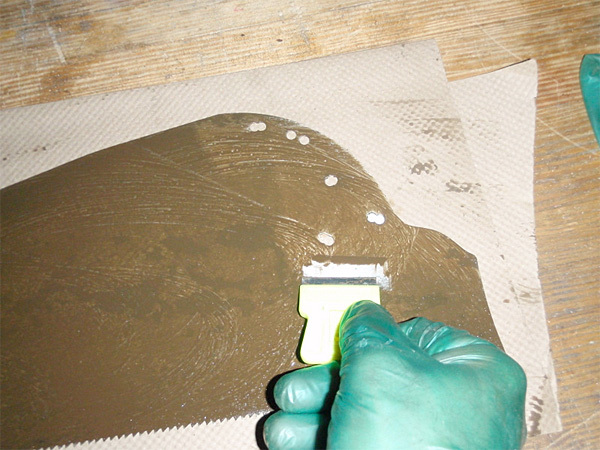 The razor is also good to use on other spots on the sawplate where rust is heavily built up. 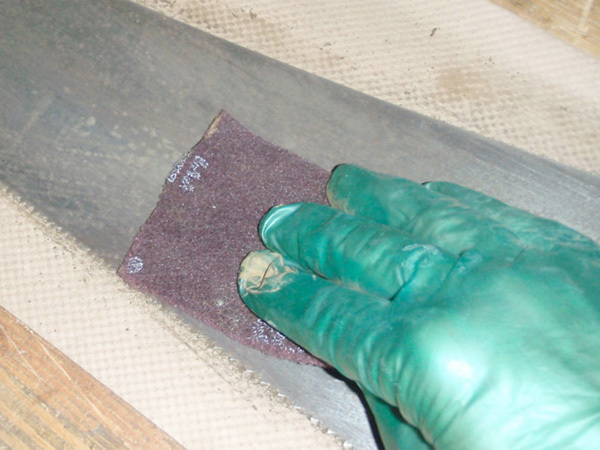 Using all the abrasives shown in the outlay, concentrate on really getting the teeth clean. This is where having a clean sawplate really counts. Rusted teeth just won't cut well, and it's worth the time to clean them up right. Be careful—they like to bite fingers, lol. Now that you've shredded your sanding sponge, wipe down the plate with a paper towel and go to work on it with your Scotchbrite medium and fine pads. Great products, useful for wood finishing as well. 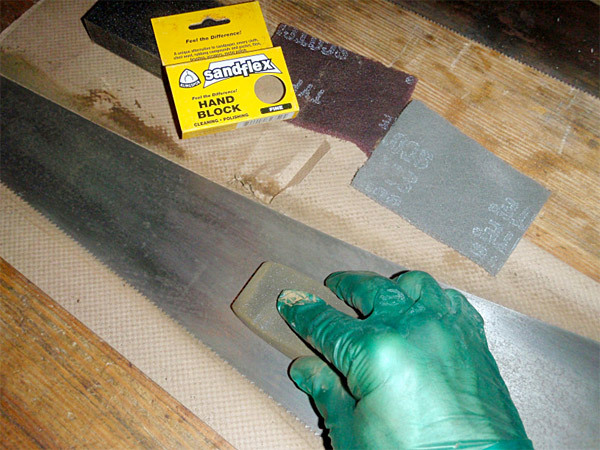 Another product I like to use are sandflex blocks; they're rubberized sanding blocks with varying grits (yellow is fine, green medium, and red coarse). I never use anything coarser than the medium block and find that the yellow/fine block handles 75% of my needs when cleaning a sawplate. 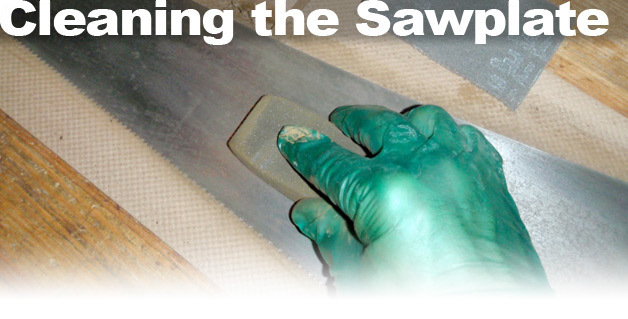 Now's a good time to flip the sawplate over and repeat the above steps prior to polishing. 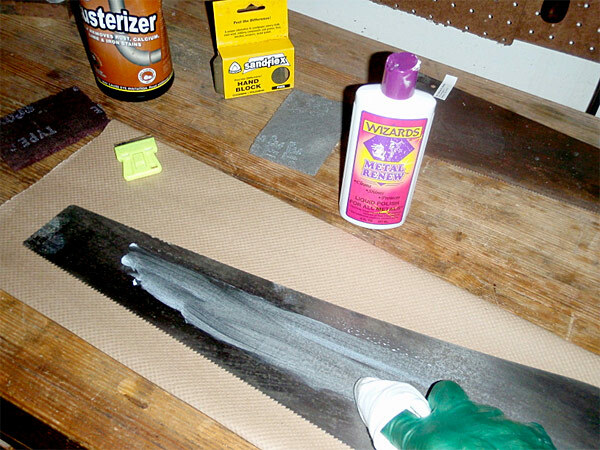 Wipe down the sawplate with another paper towel to remove any residual grit from the sanding process, and break out your metal polish. I like using Wizard's metal polish. Just squirt a little on an old tee-shirt or cotton cloth, and wipe away. Really brightens and protects the metal. And that's all there is to it. Takes anywhere between 15 minutes to half and hour, depending on the degree of rust. Rust is funny—never can tell what lies underneath, and many's been the time I've found a great etch. At any rate, if you're sending a saw to me for sharpening or repair, I strongly encourage you to clean your sawplate first.